From late teens it is time to start cleaning between the teeth in order to keep your mouth fresh and healthy as bacterial plaque constantly forms between your teeth which is impossible to reach with a toothbrush alone. The plaque must be removed regularly, or it can quickly cause gingivitis, bad breath and even cavities. Don’t stop cleaning between your teeth if your gums bleed. Bleeding gums are often a sign of gum inflammation which should stop once the plaque has been removed for a few days. If you don’t notice an improvement within a few days, or if they become sore, contact your dental professional. Our short and informative YouTube videos explain how to use VisionPerio Interdental Brushes. There are several ways of cleaning between your teeth, depending on the size of your gaps and what you prefer yourself. The consensus by dental experts based on the evidence, is that the most effective method of cleaning between your teeth when there is any space at all is with an interdental brush. Interdental brushes are more effective than any other product on the market (mouth washers do not work and may stain your teeth) and are easier to use than dental floss. In younger patients it is unlikely there will be many obvious spaces between the teeth. Interdental brushes should not be forced through where there is no space. Although the finest interdental brush will not be very robust, the Mini Vision Interdental brush is probably the strongest available. They should be utilised without any feelings of discomfort, even if the gum bleeds. 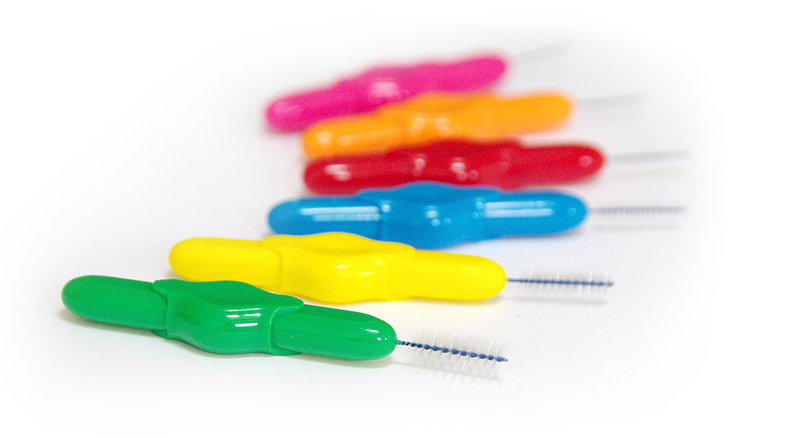 The Mini Vision Interdental brush comes in 6 sizes to fit different interdental spaces. You may need a variety of sizes (which have colour coded handles) as all gaps between the teeth differ in size. When choosing the correct size brush, make sure it fits snugly between the teeth. This may mean you need to go up or down a size or two depending on the fit. Visit our online shop for our full product range of Mini Vision and VisionPerio Interdental Brushes. It may help to put a slight curve in the brush by bending the wire around your little finger to ensure you do not catch the inside of your gum. Use a gentle back and forth motion 2-3 times (do NOT scrub) using a little pressure to compress the gum and remove any plaque or food debris. After use, rinse the brush and allow to air dry. Replace the hygienic lid only if you are carrying a brush with you. Use a new brush if the bristle show signs of wear or come loose. We recommend using the VisionPerio Interdental Brushes once daily, and before regular tooth brushing. Avoid using toothpaste or antiseptic on the interdental brush as this may be abrasive or could stain your teeth and is unnecessary. The VisionPerio Interdental brush comes in 6 sizes (colour coded) and has a curved brush head to clean deeper between the teeth into the gum pocket and to prevent catching the inside gum. Don’t hold the tail, hold the tip of the bristles – like a pen. This gives a good grip close to the point of access and allows more control. With teeth only slightly apart, hold the brush as near to the bristle end as possible with your one finger and thumb inside the cheek and feel for the furthest gap between the teeth (you don’t need to use a mirror). The top right side of the mouth seems to be the most difficult to clean and has often been found to have the greatest bone loss. If you are right handed for instance, we suggest you begin between the teeth on the top right, with the largest brush that you feel would be appropriate. Taking a little of the brush at a time. Ease the first brush through the interdental space with as tight a fit as you can. Insert the brush head curving downwards between the upper teeth, (curving upwards between the lower teeth) compressing any spongy gum as you go. A ‘wiggle’ movement will help you to do this. Feed the Brush through the inside until almost all the bristles have gone between the teeth and wriggle out again, moving up the curve of the brush whilst keeping your finger and thumb close to the teeth. Use before regular tooth brushing, once in, once out, once a day. Do not scrub back and forth as it is not needed if the fit is snug. You may get some brushes only into one or two places in the mouth. Move down to the next brush size and repeat. To help you choose the right size and colour of VisionPerio Interdental Brushes, please download our leaflet (how to use the brush).